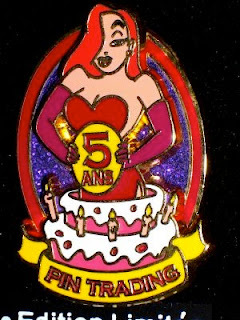 Jessica is popping out of a cake lit with candles, the banner below reads "Pin Trading." Jessica is holding a circle which says "5 Ans" for 5 Years. Jessica and the cake are pin-on-pin. The circular background is outlined in red and is purple glitter filled.